East Boston may be the first part of Boston that you see, as you land at Boston's Logan Airport. East Boston, where you'll find Boston-Logan International Airport, is northeast of Charlestown (map). 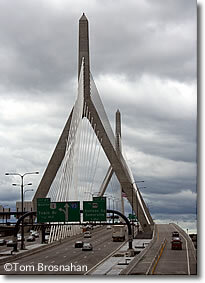 —Ted Williams Tunnel carries the Massachusetts Turnpike (I-90) underneath Boston Harbor from South Boston directly from South Boston and the Boston Convention & Exhibition Center to Logan Airport (map). The "T" Blue Line subway also connects the center of Boston with the airport. Take the Blue Line train (from Government Center, for example) to the Airport station.